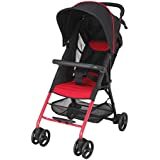 I've been looking at relatively small/cheap strollers to travel with. This was on sale when I purchased it ($20). I was hesitant at first based on reviews of it being too small but I took the chance anyways and I'm really glad I did. My son is 21 months and has always been at the 80th percentile for everything. He fits perfectly in this and will fit in this for a little while longer. He's able to climb in and out of it himself with no issues. 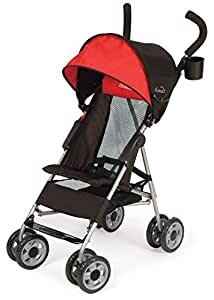 I'm not sure if people don't realize what an umbrella stroller is but expecting it to be any larger would defeat the purpose of it being one. The canopy is amazing as is the mesh back. We're taking this on summer vacations so those were really nice to have. The basket is small underneath but it has plenty of room for the necessities. 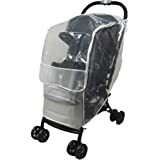 Again, this is an umbrella stroller. 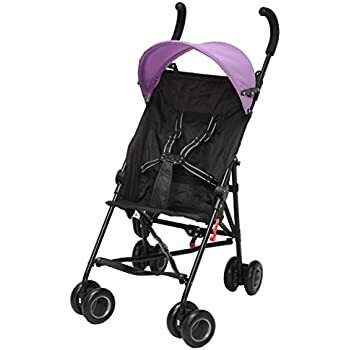 The height of the handles are perfect for me (I'm 5'5), very comfortable, and easy to steer with one hand. We're taking this on vacation in Monday so haven't really used it a ton yet but I'll update my post if my opinion changes. Needless to say my son loves it and wants to go for rides all of the time. For the price, features, and quality, this is definitely a great stroller! Pics of my son and then Scout for sizes will be added as soon as the Amazon app will let me! 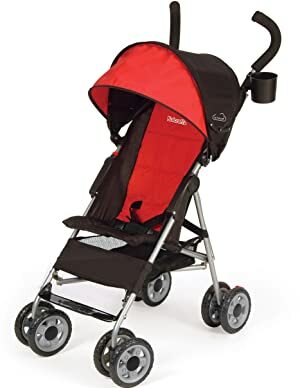 I really like this stroller. Only four stars bc it's really narrow. 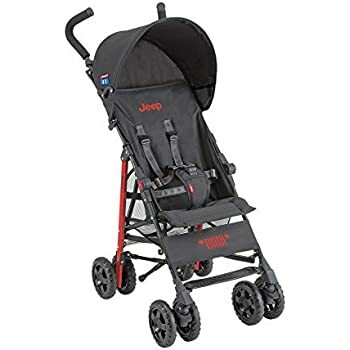 I think my baby will grow out of it way sooner then expected (he's only a year and half and almost too big for it) and since it's so narrow, you kick the wheels when walking. I'm 5'2 so it's easy for my to push comfortably, my husband has to lean down quite a bit and it's uncomfortable for him being 6'. There's really pretend storage space underneath. Barely fit my purse.. Or anything else. But.. It was super easy to put together. Basically pop the wheels on and the sun shade. 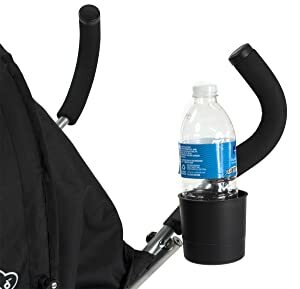 The cup holder pops off easily but goes back on just as easy so it's not a big deal. 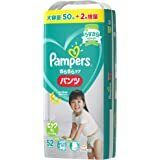 Over all, pleased with the item and price. I purchased this for a trip to Central America where I didn't want to deal with a heavy stroller. It worked perfectly, handling the uneven roads and gravel paths with ease. We did end up pulling it backwards over some section, because the rocks were too big to push over, and it worked like a charm. It stood up to rough handling, as we looped the diaper bag over the handles, along with anything else that fit. The vented back was much appreciated by my toddler, because he was able to feel the breezes. The basket underneath is small, but was able to fit a couple water bottles (on the sides) and his shoes (which he constantly removed). My little guy LOVED the canopy, pulling it over his head whenever the sun was too bright. That was easily the best feature of the stroller. The only negative is that the cup holder doesn't hold on very well. I will probably throw it away because picking it off the ground every few minutes is a hassle. 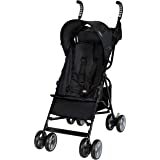 Great stroller for the price! 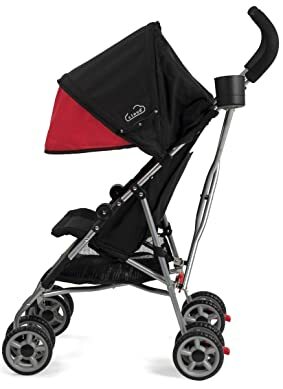 I am very impressed at the quality of this stroller. 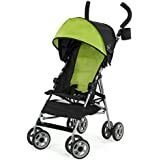 We have a Mutsy Evo stroller for our every day use and love it, but since we travel a lot we decided we needed something light that would fold small. The canopy on this is huge, which was the selling point for me – but something that was unexpected is that it is a great height for my husband and myself who are both tall. The wheels seem well-made, as well as the frame itself. 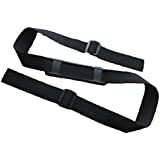 The one thing I would say is that I was not too thrilled about is that the harness is not a five point, but only a three point. It still is awesome for the price. 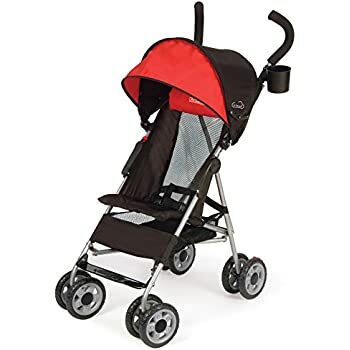 I like this stroller but don't love it. 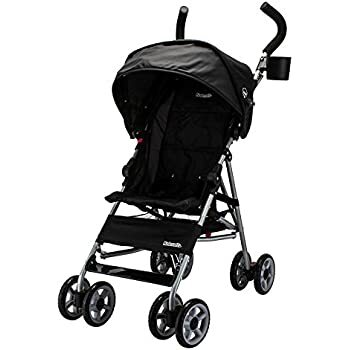 It's very lightweight which is great but I am 5'2 and my feet hit the wheels while walking. I think it's because the handles to push it are too short. It's good for a quick use but going on a long walk i would not use this.